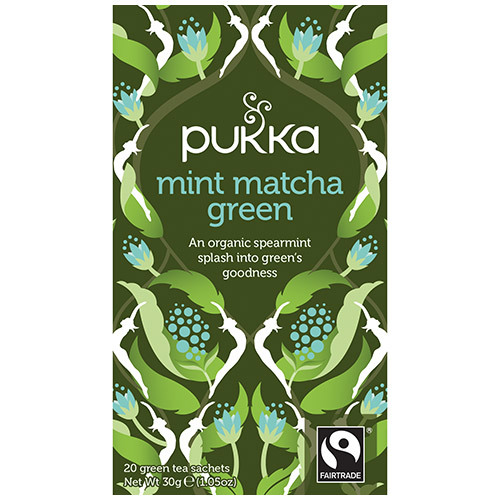 A refreshing organic whole leaf green tea, deliciously infused with Egyptian spearmint with added Matcha powder. Could this be your ticket through today? First, the perkiest fairly-traded Egyptian spearmint, as fresh as the wind whistling through your hair. Then, a surge of smooth Sencha green whole leaf, as invigorating as a morning mountain walk. Cool, crisp, alive. Have a great day. This upgraded blend complements the Supreme Matcha Green to present a range of Matcha green teas providing a full boost of antioxidants whilst differentiating from other green teas. Sencha green tea, spearmint leaf, fieldmint leaf, Matcha powder (Jejo do Garucha). Below are reviews of Pukka Teas Organic Mint Matcha Green - 20 Teabags x 4 Pack by bodykind customers. If you have tried this product we'd love to hear what you think so please leave a review.